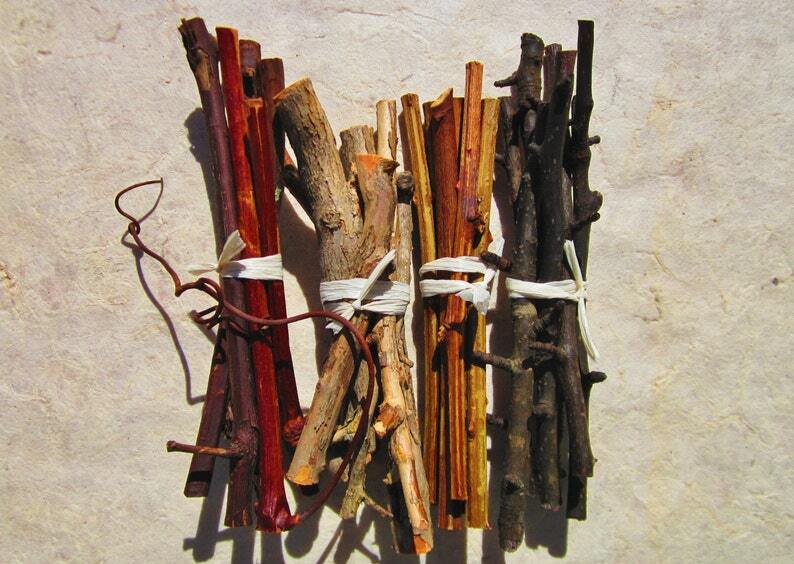 Choose between five varieties of all natural thin baked fruit wood sticks for your rodent to chew on. Rodents have teeth that never stop growing so you must provide them with safe and healthy chews to keep their teeth worn down and provide an outlet for their natural instincts and energy. These 4" to 7" slow baked wood sticks are apple, blackberry, pear, blueberry and grape. The blackberry canes have been stripped of thorns. All of these sticks were cut from fresh, live, healthy wood; no downed, diseased, or old dead wood is ever used. Chinchilla and rat experts recommend BAKED wood chews to eliminate the threat of passing along bacteria, diseases, and germs to your caged pet, which may not be immune to wild-borne pathogens or illnesses. Please check all photos to see these beautiful varieties. Your order may appear different as baked fruit wood bark can vary in color and texture from harvest to harvest. Thickness varies from very thin - under 1/4" , up to 1/2" in diameter and you will receive an assortment of sizes unless you specify if your pet prefers thinner or thicker chew sticks. They were hand trimmed from organically grown trees and berry bushes in New Hampshire. None of these trees or bushes have ever been sprayed or had any sort of chemicals or pesticides applied. They were cut with hand clippers - no chainsaws, gasoline, exhaust fumes, oil, or power tools have ever contacted these sticks. The mixed fruit wood sticks are all natural, without any added flavorings, dyes, or scents. Food coloring is a chemical additive that is not good for you - why would you give it to your pet? Suggested for chinchillas, rats, mice, gerbils, hamsters, rabbits and guinea pigs. I can not accept returns on pet chew sticks. If your pet does not seem interested try dipping your sticks in some fruit or veggie juice. I only received 2 of the apple, and my other chew pieces were very skinny and twig like. First time I've ordered was expecting to receive what was pictured. As written in the description, the assorted pack contains two sticks of each of the five flavors, for a total of 10 sticks. This buyer correctly received two apple sticks as described, but also received three or more of each of the other 4 flavors. I always send extra chew sticks. Also in the description I inform buyers they can specify whether they prefer thinner or thicker sticks. I am happy to send whatever size your pet prefers. The first photo does not show the assorted pack so this is not what this buyer ordered. I am happy to show prospective buyers a photo of exactly what they will receive.